Good Chance in Paris. Photo: Raphael Hilarion. During the twenty-first century, with an increasing interest in the Arab World among Western nations, the number of theatrical performances dealing with that world and created by artists from Arab nations has significantly and steadily increased on Western stages. A marked increase in such work has occurred during the past three to four years, and this has clearly been inspired by the enormous increase in emigrants and refugees from the Arab World, particularly from Syria and Iraq, an increase which has had an enormous impact on Western societies politically, socially, and economically. In 2015, the German chancellor Angela Merkel announced that Germany had a “national duty” to grant asylum to victims of the war-torn Middle East, and during the following two years more than a million refugees arrived in Germany and more than half of that number, mostly from Syria, have now been settled in that country. No other Western nation has accepted as many refugees during these years, but almost all have felt some impact from this enormous migration, and not surprisingly, one can see on many stages the impact of this new diaspora in many works by and about persons involved in it. Not surprisingly, the greatest impact of this movement can be seen today in Germany, the Western nation that has been most welcoming to the new refugees and asylum seekers. At the center of this new movement is one of Berlin’s major state-operated theatres, the Maxim Gorki, which has been centrally concern with immigrant matters since the arrival of a new director, Sermin Langhoff, in 2013. Langhoff came to Berlin as a child with her parents from Turkey and became involved with the long active Turkish theatre community in that city. In 2008, she became director of the small Berlin experimental space the Ballhaus Neuenstrasse, which was located in an emigrant neighborhood and which became a major Berlin theatre under her leadership. Her special interest began with what she called “post-emigrant theatre,” that is, a politically oriented theatre created by the children and grandchildren of emigrants. Her success at the Ballhaus gained her the invitation to direct the Gorki, and she began at once to turn this traditionally conservative and classically oriented theatre toward contemporary social concerns, particularly those of minority groups. When the new waves of emigrants began to arrive in Berlin, the Gorki was thus already oriented toward their concerns and it became at once a major center in Germany for Arabic diasporic performance. In November of 2016, the Gorki brought six professional actors in exile from Syria, Palestine, and Afghanistan together to form the Exile Theatre, housed at the Gorki and financially supported by the German government and private foundations. The actors are integrated into regular Gorki productions, but also present two productions created by themselves each year, based on the diasporic experiences of themselves and others. The first such production, Winterreise (Winter Journey) was presented in November of 2017. It was a great success in Berlin and has toured to seven major German-speaking cities. The text is in German, English, and Arabic, with supertitles in all three languages. No other European country has attempted to welcome contemporary refugees from the Arab world so significantly as Germany, and in no other is refugee theatre so important a part of contemporary performance, but the Arab diaspora has nevertheless significantly impacted theatre in many countries of the West. In 2011, London began offering every summer the Shubbak Festival bringing to that city artists and productions from across the Arab world. The most recent Festival featured artists from Egypt, Iraq, Tunisia, Syria, Palestine, and Morocco. Although the Shubbak Festival has included the work of both refugee artists and companies still based in their home countries, in 2016 London was host to a project closer to the Exile Theatre of Berlin or Open Borders of Munich. This was the Good Chance Festival which, like much such contemporary work, involves cooperation from a number of Western countries. The Jungle in Calais. Photo: PHILIPPE HUGUEN/AFP/Getty Images. The Jungle Production at Young Vic. Photo: Young Vic. 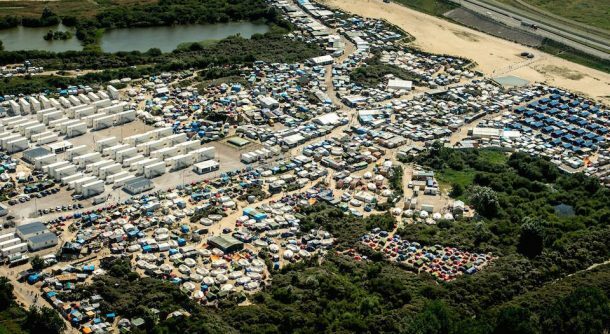 Good Chance actually began in one of Europe’s largest and best-known refugee and migrant camps, The Jungle in Calais, largely inhabited by refugees from the Arab world hoping to make their way across the Channel into England. 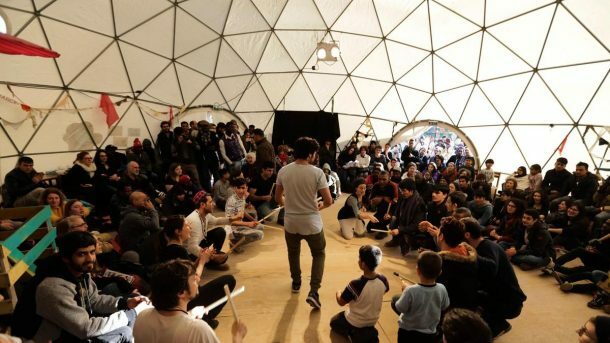 In 2015, a large geodesic dome was opened in the camp to serve as a theatre and cultural center for the inhabitants. Although the camp was closed and leveled by the French government in the spring of 2016, the work of Good Chance has continued in both London and Paris. A number of theatrical works developed by the refugees here were presented as a festival in London in 2016. 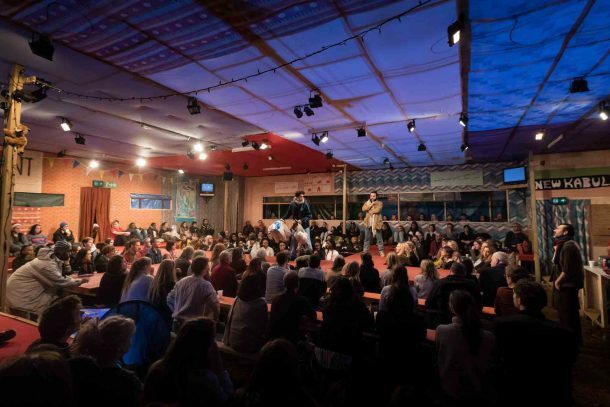 Equally significantly, two British playwrights, Joe Martinson and Joe Murphy, authored a play called The Jungle, set in a recreated Afghan restaurant in the camp. This, directed by Stephen Daldry, one of London’s most distinguished directors, in a leading experimental theatre, the Young Vic, was an enormous critical and popular success at the end of 2016. Not only did it focus the attention of the British public on the refugee crisis but its cast included a number of actors actually from the camp who had successfully made their way to London. At the beginning of 2018, Good Chance moved the Jungle dome to in Paris and built a smaller version next to it. These offer opportunities to create and observe theatre to the rapidly growing refugee population of Paris, now reportedly growing by 80 to 100 members daily. Ayad Akhar, Disgraced (2013), Lyceum Theatre, New York, NY. Photo: Variety. The United States, a country built upon immigration, has a long history of plays dealing with both emigrants and bicultural post-emigrants. Traditionally these have dealt primarily with earlier waves of emigration—German and Scandinavian, then Irish and Jewish, while in recent theatre the Arab-Islamic diaspora has taken on a new prominence. 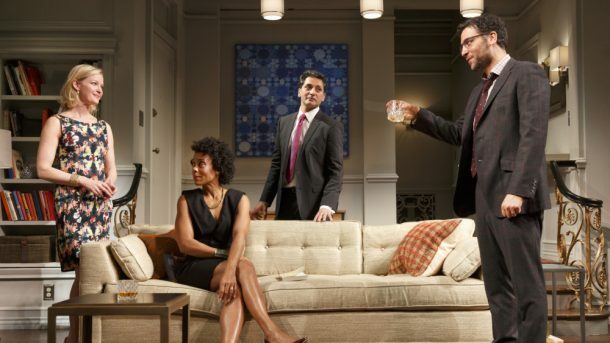 The outstanding new play on Broadway in 2013 was Disgraced, by a Pakistani-American playwright, Ayad Akhar. It won the Pulitzer Prize and many other awards, and has been produced all across the United States and abroad. Strictly speaking, it is a post-emigrant play, showing a bitter conflict between the apparently assimilated children of Arab and Jewish emigrants. 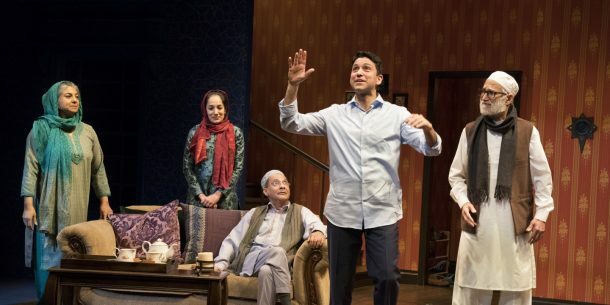 Much more directly related to the emigrant experience is one of the most popular plays in New York this season, An Ordinary Muslim, by a Pakistani-British dramatist, Hamaad Chaudry. Hamaad Chaudry, An Ordinary Muslim. Photo: Sara Krulwich. Although these works have achieved important success in major commercial theatres in London and New York, one of the most significant diasporic works of recent years to gain widespread attention in the West has been a much more modest and unconventional work, performed mostly outside the traditional theatre world by solo actresses. Oh My Sweet Land was a project that originated at the theatre of Vidy-Lausanne in Switzerland, an organization that has been involved with providing aid and activity for new immigrants to its region since 2015. In 2017, the theatre organized a workshop for nine theatre students from various Arab countries, who took a series of classes ending in a public presentation. This was followed later in the year by another performance, co-created by these students and young Swiss theatre-makers of the same age. In 2014, the Lausanne theatre co-created another immigration-oriented project with a London theatre having a strong interest in refugees and diasporic performance, the Young Vic (where the British version of The Jungle had been produced a year earlier). This was a solo performance entitled Oh My Sweet Land, which in the four years since its beginning, has toured widely internationally and has become one of the best known, most popular, and most innovative of Western works dealing with the Arab diaspora. The single character in Oh My Sweet Land is a German-Syrian woman now living in exile in Paris. In the honored Arabic tradition of the storyteller, she tells of her life among the diasporic community in Paris, and the story of her trip back to Lebanon, Syria, and Jordan in search of her activist Syrian lover and of the people she encounters on this quest. 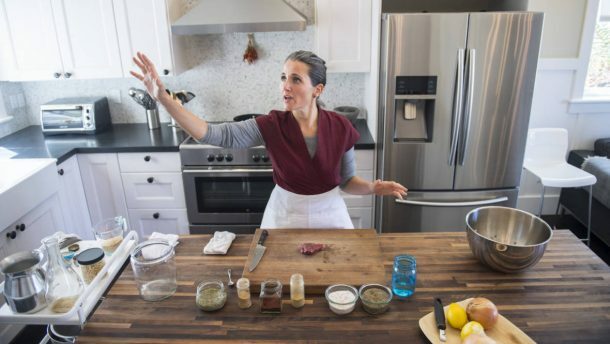 The most distinctive feature of her presentation is that as she tells her story, she is working in her kitchen, presumably in Paris, creating a traditional Syrian meal of kubbeh. As she kneads the dough, cuts up the meat and onions, mixes them and cooks the elements, the smells drift out over the audience, adding an extra level of authenticity to her narration. The “wheat, heat, meat, Syria,” she chants as she works, evokes the countryside and the culture she recalls in exile. The creators of this piece were ideally suited to the task. Corinne Jaber, like the character she played, was a German-Syrian woman now living in France. The author of the text and the director of the production was Amir Nizar Zuabi, a Palestinian who is widely considered the leading theatre figure in the Middle East today. Corinne Jaber in Oh My Sweet Land. Photo: Livemint. Zuabi’s first major project was Alive from Palestine, created at the private al-Kasaba theatre in Ramallah and performed by six Palestinian actors describing life under the Israeli occupation. During 2002 production toured internationally with great success. It was honored as Best Production at the Cairo Theatre festival and Carthage Festival and was presented at Royal Court London, the Tokyo International Arts Festival, the Goteborg Festival in Sweden and the New Haven Festival in the United States. This success gained Zuabi an invitation to direct a Sam Shepard play at the Young Vic in London, beginning an ongoing association with that theatre. He worked there for a year, then returned to Palestine, where he directed for the National Theatre and formed a new touring company, Shiberhur. The company’s first production, in 2008, was Zuabi’s best-known work, I Am Yusuf and this is My Brother, based on the dispossession of Palestinians from what would become Israel. After touring the productions to Palestinian communities and refugee camps, the play had its European premiere at the Young Vic and the following year, Zuabi became an International Associate Director of that theatre. His most recent work in this international role was Oh My Sweet Land, presented first in Switzerland, then at the Young Vic. Since then it has been produced elsewhere in Europe, in the Middle East, in India, and in the United States and Canada, making it one of the most widely circulated statements on the contemporary Arabic diaspora to be presented on the international stage. Sussan Jamshidi in Oh My Sweet Land. Photo: Sultan Baldo. As important as its subject matter, and closely connected with that, has been the variety of performance conditions and of performers who have brought this work to an international audience. The production remained generally the same in Europe, but when it came to America in a variety of productions from 2016 onward, it appeared with significant variations. Three producing organizations, all involved with Middle Eastern theatrical expression in America, were instrumental in introducing the work to North America. The first of these was Silk Road Rising, an organization founded in Chicago in 2002 in response to the events of 9/11 and public anger against the Arab world. 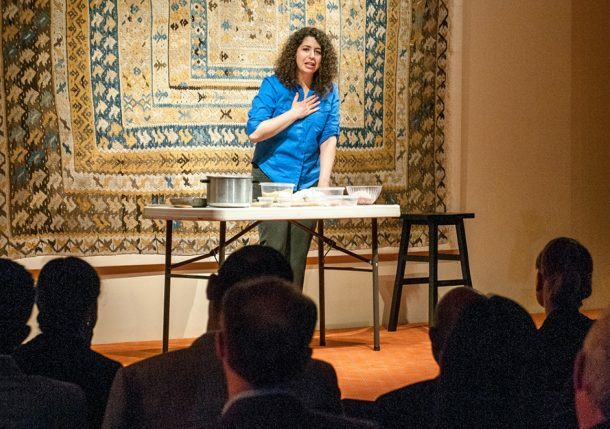 Since that time, through theatre and storytelling Silk Road has supported the Arab diasporic community in the United States and worked to educate the general public about the Middle East. In November 2016, they presented the first North American production of Oh My Sweet Land at the Aga Kahn Museum, an Iranian cultural center in Toronto, Canada. Their performer was a Chicago actress of Iranian descent, Sussan Jamshidi. In following spring Jamshidi performed the work at another Iranian culture center on the other side of Canada, at Burnby, British Columbia. Nadine Malouf in Oh My Sweet Land. Photo: Michelle V. Agins. In the meantime, the play also was presented on both the East and West Coast in the United States. The first U.S. production was in New York in September 2017, and was organized by the Play Company. Although the Play Company, formed in 2006, is not, like Silk Road, focused on Middle Eastern subjects and dramatists, it is concerned with global questions and with social concerns. It often works with international social agencies and for Oh My Sweet Land, its producing partners included some of the world’s leading refugee support organizations: The International Rescue Committee, Hearts and Home for Refugees, Madre, and the International Refugee Assistant Project. Like Silk Road, the Play Company found a new actress to play the solo role, Nadine Malouf, born in Australia, but of Lebanese descent, adding another Middle-Eastern element to the production’s mixture. This staging, which has been presented in a wide variety of locations in New York and New Jersey during the past year, has differed in a major way from that of previous presentations. In Europe, Oh My Sweet Land was presented in intimate spaces, but all were conventional theatre spaces. Those in Canada were in cultural centers. 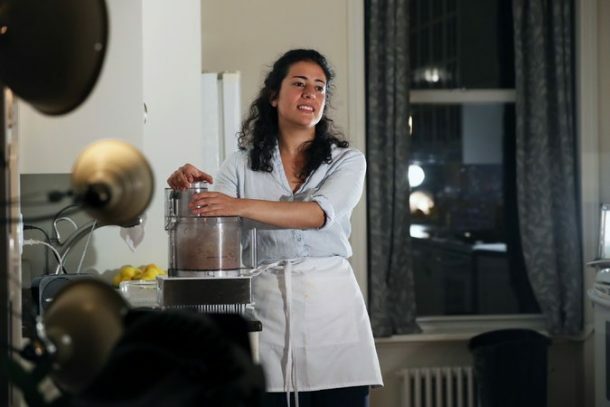 In New York, the Play Company staged the work instead as a site-specific event, in actual kitchens of a number of local homes and apartments. This not only gave the production an even greater reality and intimacy (usually only about twenty audience members could be accommodated) but it also tied in the performance with other experimental work outside traditional theatres, which has been an important part of the New York experimental theatre for the past several decades. Such productions have often taken place in private homes, with discussion plays in living rooms and meal preparation plays in kitchens being particularly popular. Nora El Samahy in Oh My Sweet Land. Photo: David Allen. An Egyptian-American actress who has often appeared in Golden Thread productions, Nora El Samahy, presented the work in San Francisco. The production was first given in October 2017 at the Glide Memorial Church in that city, long a center for experimental theatre and social work, like the Judson Memorial Church in New York. The production was such a success that it was revived for a month of productions in March 2018, but this time, inspired by the New York productions, it was presented in private kitchens all over the city. As in New York, every production was sold out and the demand for tickets for exceeding the number available. Plays by and about participants in the Arabic diaspora have become much more common in the United States and Europe in the twenty-first century, but during the last two years a major new concern has been the subject of many such plays, that of forced emigration and the problem of refugees, placing strains on the social and economic fabric of countries throughout the West. Powerful dramatic works, such as most recently Oh My Sweet Land are today providing explorations of this concern and their widespread success provides clear evidence not only of the insight and skill of their creators but of the powerful international interest in this subject throughout Europe and America. Marvin Carlson is the Sidney E. Cohn Professor of Theatre, Comparative Literature, and Middle Eastern Studies at the Graduate Center of the City University of New York and Editor-in-Chief of Arab Stages. His research and teaching interests include dramatic theory and Western European theatre history and dramatic literature, especially of the 18th, 19th, and 20th centuries. He has been awarded the ATHE Career Achievement Award, the George Jean Nathan Prize, the Bernard Hewitt prize, the George Freedley Award, and a Guggenheim Fellowship. He has been a Walker-Ames Professor at the University of Washington, a fellow of the Institute for Advanced Studies at Indiana University, a visiting professor at the Freie Universitat of Berlin, and a Fellow of the American Theatre. In 2005 he was awarded an honorary doctorate by the University of Athens. His best-known book, Theories of the Theatre (Cornell University Press, 1993), has been translated into seven languages. His 2001 book, The Haunted Stage won the Calloway Prize. His newest book is Four Plays From Syria: Sa’dallah Wannous (Martin E. Segal Center Publications, 2014). Editorial and Advisory Board: Fawzia Afzal-Khan, Dina Amin, Khalid Amine, Hazem Azmy, Dalia Basiouny, Katherine Donovan, Masud Hamdan, Sameh Hanna, Rolf C. Hemke, Katherine Hennessey, Areeg Ibrahim, Jamil Khoury, Dominika Laster, Margaret Litvin, Rebekah Maggor, Safi Mahfouz, Robert Myers, Michael Malek Naijar, Hala Nassar, George Potter, Juan Recondo, Nada Saab, Asaad Al-Saleh, Torange Yeghiazarian, Edward Ziter.